Be the first to know when hard-to-find products are back in stock. Stock Informer is the real-time stock checker that helps you track down those hard to find products. We track both Online Retailers and selected High Street stores ensuring you are the first to know when stock is found. Our service is completely FREE and we'll send you immediate notifications when stock is found for the product you are searching for. We constantly check for stock so you don't have to. Immediate audible notifications via your desktop PC/MAC web browser. 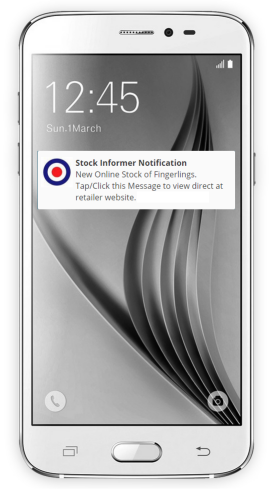 Immediate push notifications direct to an Android mobile or desktop browser. We will continue to help until you find the item you want. We stock check both online retailers and selected high street stores. We have relationships with the UK's top retailers. The UK's original and most popular stock checking service. Just checkout all the testimonials we have received since 2010. We will never charge for this service. Be one of the first know about stock. Also available for a desktop PC/MAC using Google Chrome, Firefox or Safari web browsers. Fantastic service. I couldn't find the item I wanted as it had sold out everywhere. Thank you, you saved me hours of trawling through the internet or shops. FANTASTIC - just managed to get my child's most wanted toy for Christmas which is like gold-dust. Huge thanks to Stockinformer from a very happy mummy. Brilliant service. I was able to purchase what I was after promptly after a notification. Thank you. Brilliant idea, worked a treat, thank you!! Thank you so much for offering this amazing service. I’ve found all my children’s gifts through you. The toys I thought I’d never get. @StockInformer thanks to you I now have slime factory and fingerlings. Great service here, recommending to everyone. Shame santa gets all the credit!